Money? Fame? Glory? Love? Family? Ambition? For the autumn leaves that rustle under your feet? For the smell of the soil after rain? For the juicy peaches that melt in your mouth? For the sound of the tumultuous waves when they reach the shore? For the laughter of a child that views the world as a wonder? Darrow au Andromedus fights for the freedom, the opportunity to live for the above. For an oppressed people that hides in the shadows of the so-called superiors for centuries. But in order to escape the monster, you either hide or fight. And fighting is the path, the painful, bloody, sinister path Darrow chose. Betray your friends. Scheme with your enemies. Rise next to people who stole your everything. Alienate those who genuinely care about you. And in doing so, become the monster yourself. Darrow is a Peerless Scarred now, but he's not even close to his mission; destroy the Society, and the Colours, before the Society destroys him. After an unfortunate incident in the Academy his position is precarious, and Nero au Augustus is ready to renounce him and leave him unprotected against the Bellonas, the powerful family that wants his head on a silver platter. But then the Sons of Ares reemerge, giving him orders too cruel to follow, and Darrow realises that the way to make the Society fall apart is civil war. Red Rising was a superb debut that set the standards for the sequel of very high. You all know the dreadful term 'middle book syndrome', right? Well, forget it, because instead of a lame, weak second book, the genious called Pierce Brown gave us a masterpiece. As the story progressed, and Darrow had to make difficult decisions for the sake of his mission, I mourned him; I mourned every piece of his soul, of his conscience, of the past Darrow he had to sacrifice in order to make Eo's dream come true, and give a future to those who were denied it. Sometimes he was lost beyond redemption, a cocky, brutal Gold that stabbed his friends in the back and led armadas and thousands of people to their death with a simple order. 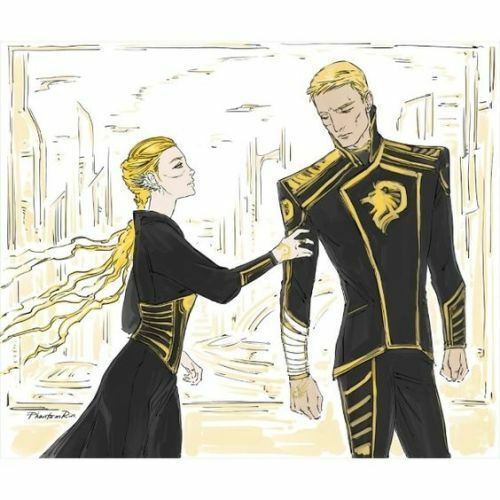 But some other times, those rare moments he chose to trust, to protect the weak, to arm a terrifying giant and make love to the girl who stole his heart, he was a fiery Red. In the end, Darrow is both. The amagalm of two cultures, the weapon to divide only to unite. Golden Son is focused on war and politics, plots and treason that put you on constant alert. 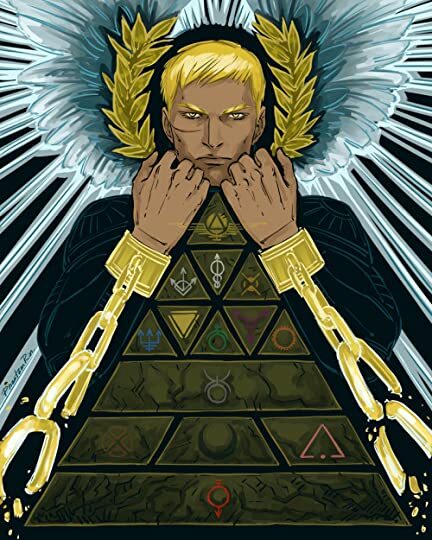 Pierce Brown imagined and brought to life vivid, heartpounding space battles and massacres, he crafted high-tech spaceships and luscious palaces brimming with poisonous snakes. He introduced radiant new characters -let's take a moment to appreciate Victra and the glorious House Telemanus - and explored old ones, giving them voices and backrounds and motives and actions that shook you to the core. The death toll was extremely high. The nameless lives lost unimaginable. But this battlesong of deviousness and blood was injected with moments of jolly laughter and camaraderie that made your shields crack, and a ray of sunlight crawled into your petrified insides. There were also a couple of scenes so powerful and raw, in their simple gestures and scarce dialogues, that make you sob and feel and want to reach for Darrow and hold his hand. There was grandeur in those scenes. In the entirety of this magnificent, soul-ripping book. But except from lions, there are also jackals. And in kindness, there is malice. Darrow kept friends at arm's length and miscalculated people, only to pay with blood in the astounding, devastating ending that shred my soul to pieces. Please, please, please , read this series. And trust Pierce Brown to lead you to a dangerous journey that will stay with you for a while.